Optical neural network; perovskite passivation; improving organic solar. Using light would eliminate interference due to electrical charge and the signals would travel faster and farther, said the researchers. “Light’s advantages could improve the performance of neural nets for scientific data analysis such as searches for Earth-like planets and quantum information science, and accelerate the development of highly intuitive control systems for autonomous vehicles,” NIST physicist Jeff Chiles said. The NIST chip vertically stacks two layers of photonic waveguides. This 3D design enables complex routing schemes, which are necessary to mimic neural systems. Furthermore, this design can easily be extended to incorporate additional waveguiding layers when needed for more complex networks. 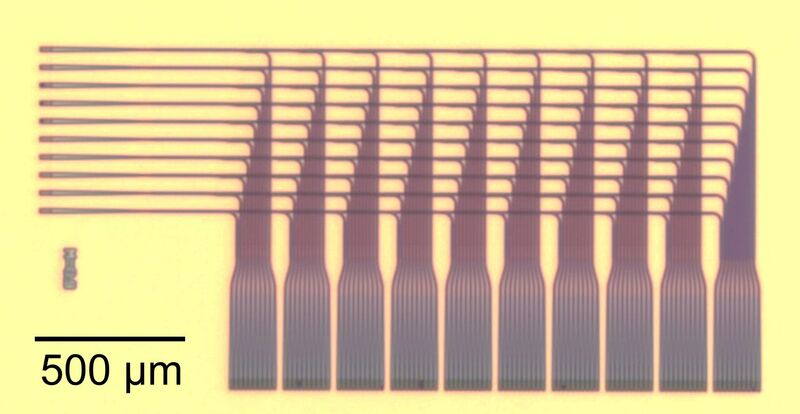 The stacked waveguides form a three-dimensional grid with 10 inputs or “upstream” neurons each connecting to 10 outputs or “downstream” neurons, for a total of 100 receivers. Fabricated on a silicon wafer, the waveguides are made of silicon nitride and are each 800nm wide and 400nm thick. Researchers created software to automatically generate signal routing, with adjustable levels of connectivity between the neurons. 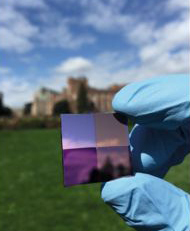 Researchers at the University of Washington boosted the performance of thin-film perovskite solar cells, beating even today’s best solar cell materials at emitting light. The solar material, a lead-halide perovskite, was chemically treated it through surface passivation, which treats imperfections and reduces the likelihood that the absorbed photons will end up wasted rather than converted to useful energy. The team used an organic compound known by its acronym TOPO for passivation. TOPO-treating a perovskite semiconductor significantly impacted both its internal and external photoluminescence quantum efficiencies — metrics used to determine how good a semiconducting material is at utilizing an absorbed photon’s energy rather than losing it as heat. TOPO-treating the perovskite increased the internal photoluminescence quantum efficiencies by tenfold — from 9.4 percent to nearly 92 percent. The next steps involve demonstrating a similar chemical passivation that is compatible with easily manufactured electrodes and experimenting with other types of surface passivation. Researchers from the University of Strasbourg, University of Lyon, Nazarbayev University, and Moscow Institute of Physics and Technology developed a way of boosting the efficiency of organic solar cells by incorporating fluorine atoms in the polymer. By experimenting with various polymer modifications, the team increased cell efficiency from 3.7 to 10.2 percent. While this is still lower than commercial silicon photovoltaics, the gain in efficiency suggests polymer-based solar cells deserve further development. The generic polymer used in the experiment has a rather complex molecular structure that consists of a chain of repeating units. Each of them includes sulfur heterocycles — rings made of one sulfur and four carbon atoms — and hydrocarbon side chains with a branched structure. The researchers produced a number of modifications of this polymer to find which one has better photovoltaic properties. 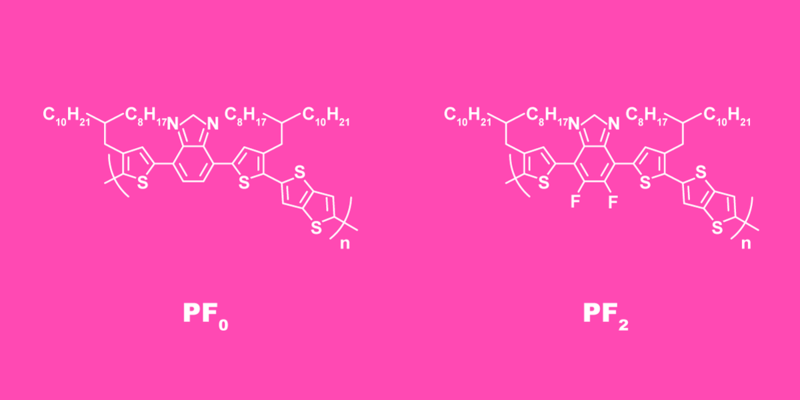 They changed the structure by adding fluorine atoms and varying the length of the side chains. One polymer configuration proved to result in vastly superior properties. Namely, the cell efficiency and current output were several times higher. The team then investigated the microscopic structure of the best-performing compound. X-ray analysis revealed polymer stacking to be more ordered. Also, the molecules were characterized by higher charge carrier mobility, an advantage for solar cells. The organic solar cells can be manufactured in fewer stages, compared with conventional silicon photovoltaics, said Dimitri Ivanov, a professor at MIPT. The light-absorbing polymers can also function as a thin film, which means the solar panels need not be flat.